"The number one source of drugs that teenagers abuse is their own home medicine cabinet," said Steve Pasierb, president and CEO of The Partnership at Drugfree.org. "Kids tell us in surveys that there is enough supply at home, at grandma's house, that they don't have to buy them." 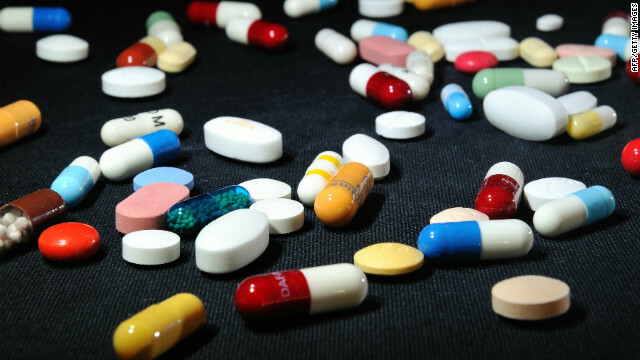 If free and easily-accessed prescription drugs for teens goes against your household rules, you may be interested in the Drug Enforcement Administration's National Pharmaceutical "Take-Back Day" from 10 a.m. – 2 p.m. on Saturday. The idea behind "Take-Back" is to provide a free, no-questions-asked way to dispose of your old prescriptions. The drugs are incinerated so that they do not end up in dumps or the water supply. "Round up all that stuff and dispose of it," said Pasierb. "Kids wouldn't (abuse prescription drugs) if they weren't still sitting in the bathroom cabinet." For information about the prescription drug abuse problem or to find one of over 5,000 take-back locations nationwide, visit the Medicine Abuse Project website. Next entry »Want kids to eat veggies? Try a good marketing plan! Dump old pills and dont get new ones as well! The only one who wins with pills is pharmaceutical companies. Really? Ditch all of our pills and don't get new ones? I'm a health-food nut, distance runner, weight-lifter, and all-round fitness enthusiast. Then my immune system started attacking my own body. You can't imagine the pain and exhaustion - the swollen joints, rashes, sores, chest pain, inflammation around critical organs, and more - unless you've experienced it. And I tried elimination diets, checking to see if there was a food allergy involved. I tried vitamin supplements. I tried everything... and then I tried time-tested prescription medications that GAVE ME MY LIFE BACK. They're generics, so nobody is getting rich off my prescriptions. I'm winning because I can go running and enjoy my life again. YOU, on the other hand, are trying to advertise worthless supplements at RIDICULOUS prices. Who is winning with this one? The patient desperately seeking an alternative cure who ends up with "very expensive urine," or your company which is drawing $50/bottle for a bunch of supplements that have not been tested for efficacy in any real, double-blind studies? Nice gimmick – pretending that you're the good guys, and the pharmaceutical companies are the bad guys, when you're even worse. Bathroom cabinet is not a good place to store meds. All drugs not in liquid form should be stored in a cool "dry" place! Besides, any painkiller is not likely to be left unused. There's that hangover, sore muscle, etc...that perfectly good and expensive drugs can relieve. Unethical? Let you be the judge! Just be sure you do NOT flush them down the toilet. They are getting in our water supply and causing problems. Either take them to your pharmacist, or do as I read somewhere and mix in with used kitty litter and put in garbage. Also if you were given antibiotics for an infection, make sure you take ALL of them. Don't stop taking them just because you feel better. You need to take the whole course for the infection to be knocked out completely. Too many people take them for a few days and stop. This is not good. I just came onto your post and found it quite interesting. I am also associated with Canadian prescription, Pharmacy on line Canada and enjoy to read the stuff on the same as its rarely found on internet. Thanks again for writing such a good post. I wish to express my admiration for your kind-heartedness supporting folks who must have help with this important question. Your personal dedication to getting the solution along was surprisingly invaluable and have really encouraged workers much like me to get to their objectives. Your new helpful information signifies a lot a person like me and somewhat more to my mates. Thanks a ton; from each one of us. I can never consider just how much for this I probably did not really understand. Thanks for offering this info. I am certain to come back at this website to discover if there is any brand new content. Hey there, truly turned into informed of your website via Google and yahoo, found that it is actually interesting. I am destined to be cautious for brussels. I can be grateful any time you go on with this in the long run. Many people may be benefited from your writing. All the best!